Make your trip smooth and trouble-free with up-to-date travel information. 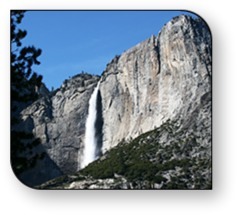 You'll love how close High Sierra is to Yosemite National Park. Experience the scenery without fighting the crowds to get a campsite — camp here instead! And of course there are no RV hookups or Wi-Fi in Yosemite, but you’ll be camping in the lap of luxury here at High Sierra! 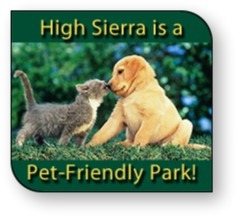 High Sierra RV & Mobile Park is on Highway 41, the most direct seasonal route to Yosemite National Park. We're located on the Fresno River in Oakhurst, CA, just 17 miles from Yosemite's South Entrance Gate and 8 miles from Bass Lake. RV-Friendly Entrance: From the intersection of Hwy. 41 & Hwy. 49, proceed 0.3 miles north on Hwy. 41 to the next traffic light at Rd. 426. Turn Right onto Rd. 426 and get into the left lane, then turn Left at the 1st traffic light (Civic Circle & Golden Oak Drive). Follow Golden Oak Drive to the end of the road (you will see our sign). Stay to the right of the sign, and our office will be on your right, next to the propane pumping station. Not all GPS devices have our location listed correctly in their database, so they may direct you in a way that's more complicated than necessary. If in doubt, use the following coordinates to be sure you end up right at our front door! 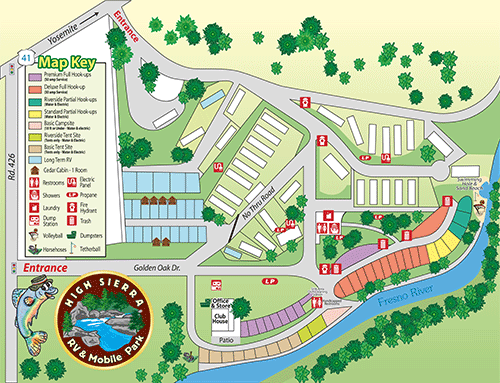 Click on the park map below for a larger, printable, PDF version.